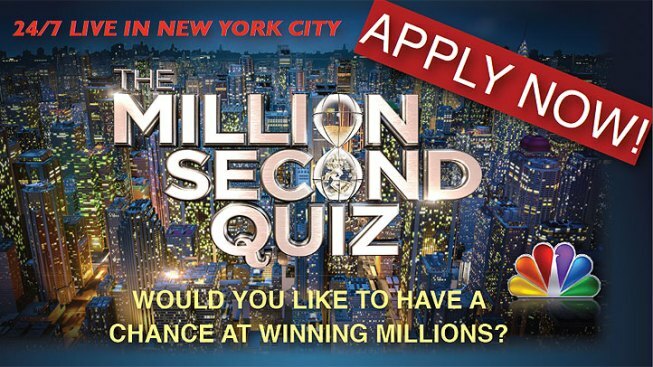 "The Million Second Quiz" is a new competition where contestants test the limits of their knowledge, endurance and will to win as they battle each other in intense quiz bouts covering everything from pop culture and current events to world history and more. Do you have what it takes to compete? Find out during an open casting call Saturday, Aug. 10. from 10 a.m. to 6 p.m. at Madam's Organ at 2461 18th St. NW in Washington, D.C.
Bring a photo with you. (It will not be returned.) You must be 18 or older and a legal U.S. resident to apply.